We all want to know “Where does our meat come from?” or “Is this a reliable information or fake news?”. If we ask this kind of questions it is always about the Provenance of information or physical objects. This article proposes the usage of neo4j to store provenance information — originally written in 2017. Provenance describes the origin and history of “a thing”. The term provenance originally has been used for paintings and their owner history over time. If there are some missing Provenance information, for example, a decade where you can’t tell who was the owner, the painting value drops immediately. Today we use the term provenance to track processes and responsibilities in general. For example to track the production of food or to track the history of a file. In 2003 the W3C adopted the official PROV standard to describe provenance structures. I don’t want to explain the complete standard only the key concepts: Entities, Activities, Agents, and Relations. Furthermore, there is a fixed set of relation types, for example, a generation or usage. You find more information in the PROV-DM spec. 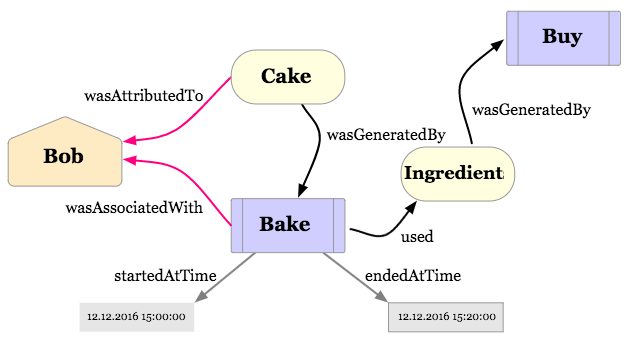 This example explains that Bob baked a cake, with some additional information like the start- and end time. Now we can follow the digraph and determinate the origin activity that created the ingredients of our Cake, in this case, the Buy activity. Of course in a real-world example, we should split our ingredients activity into multiple entities and track their process of buying or growing separately. This example tracks the production- and shipping process for a meat product. This includes each cattle, slaughters and transportation step. 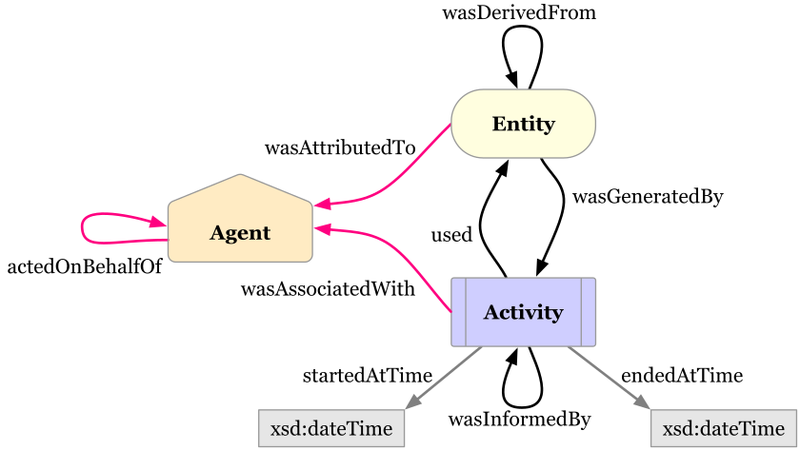 You see it is a complex digraph with many entities activities and agents. 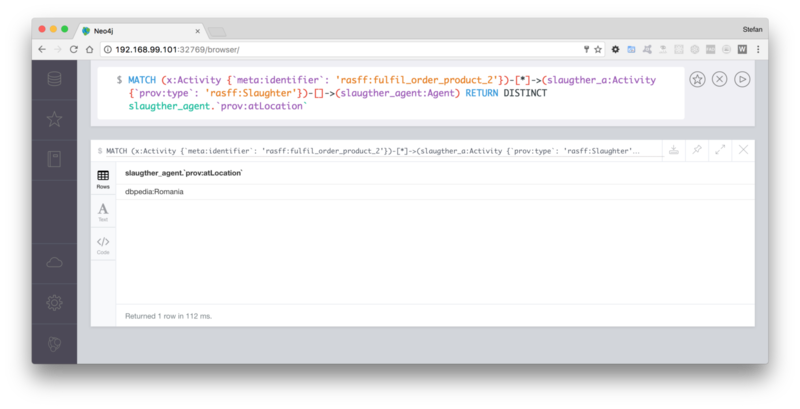 We developed a simple python module to store PROV documents in a neo4j database called prov-db-connector. 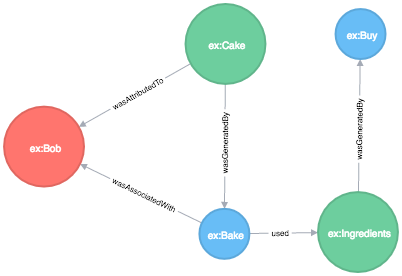 The following script saves our “bake a cake“ example into the Neo4j database. The script uses the ProvDocument from the prov library. The PROV lib provides basic functionality to serialize PROV documents. If you compare the example diagram and the actual neo4j graph diagram above you see they are really similar. Within all the information in the graph database, you benefit from Cyphers powerful query mechanisms to extract information from your graph. What is the origin of this order? Who was responsible for installation of product xyz at our client? Is this product produced under good working conditions (based on certifications) ? I saved a complex example PROV document that contains information about the production of meat. Who was the slaughter of order 2? If I track my data with a traditional data structure I probably would do some joins on tables and find the slaughter. Not complicated if all data is in one database, If not it might be complex but still doable. So why? It’s backward compatible in case of a change in the process eg. changing the transportation company. The PROV standard is interesting if you have a complex process that results in “a thing”. Like a food product or a weather prediction. For example, the computation of the temperature prediction for the next day is a complex process. The calculation is based on several satellite images and other data. In this case, it is good to know on which data the temperature calculation was based on. This could be useful for debugging or for transparency reasons. Another use-case could be the global production process and lifecycle of products. To understand the way of products and answer questions like “is this product really only build with wood from the EU?”. The PROV-Standard could be a data format to answer such questions and exchange provenance information. I’m just started to write my first few blog articles. I’m glad about any feedback — positive and negative! Just let me know if you have any questions or suggestions to improve this article! Developer Content around Graph Databases, Neo4j, Cypher, Data Science, Graph Analytics, GraphQL and more.